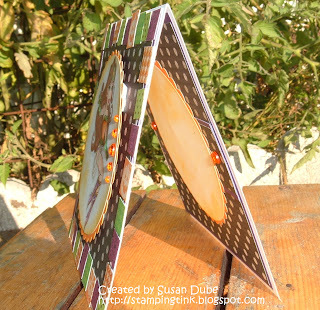 Stamping Tink: Pause Dream Enjoy - So Glad to be Here! Pause Dream Enjoy - So Glad to be Here! Question: Do you decorate for Halloween? 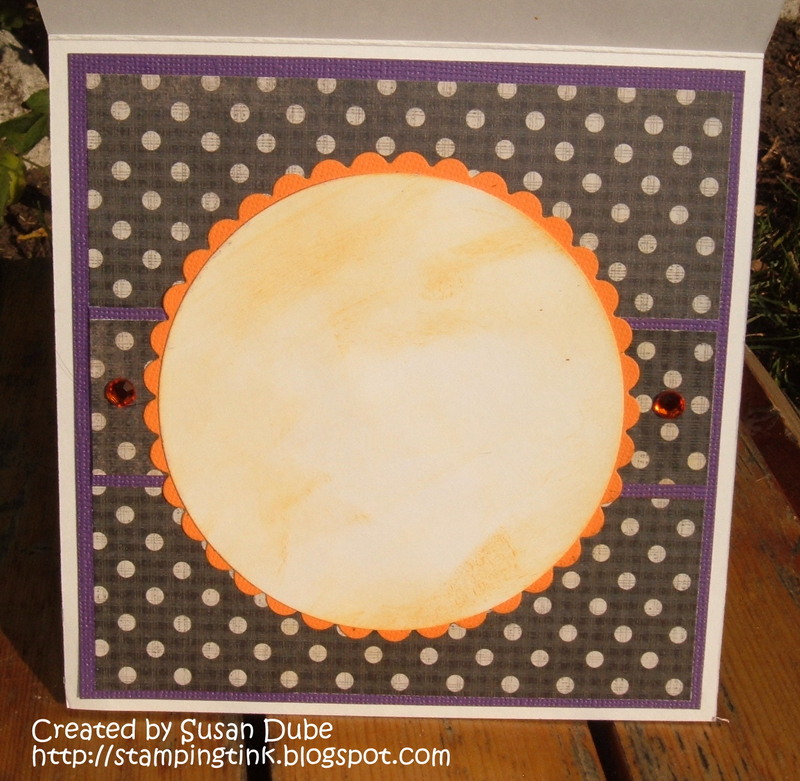 Create any type of project using Purple & Orange. Isn't she fabulous and powerful? 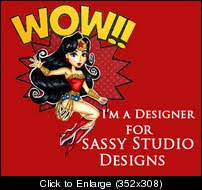 She is Wonder Regan and she's from Sassy Studio Designs. I'm so excited to show her off and to be a new member of the super talented and so generous of spirit Design Team of Pause Dream Enjoy Challenge! 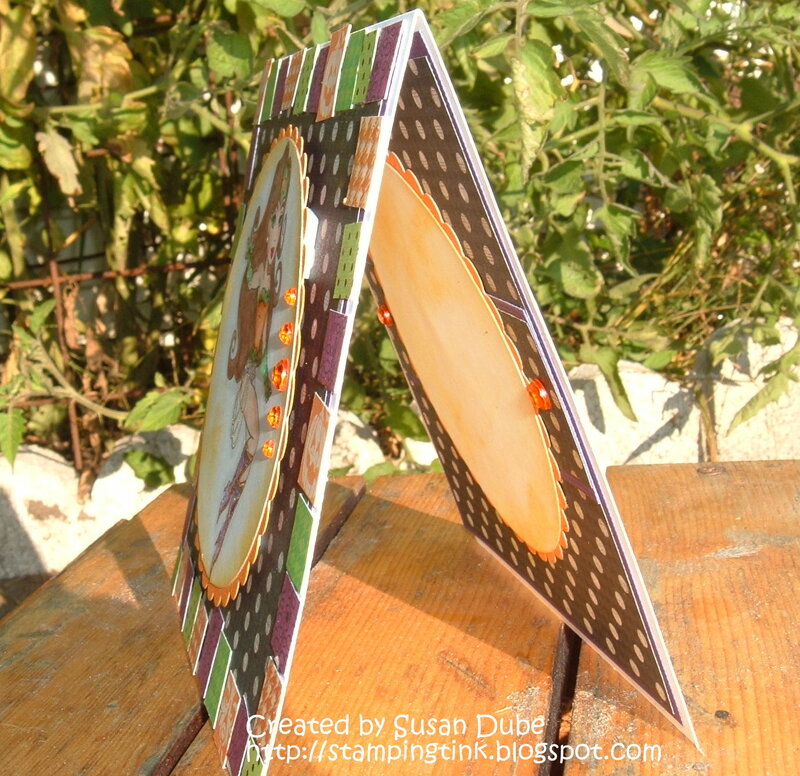 Make sure you stop over and take a look at all of the fun and inspiring projects they all have worked up for you! Since Dizzy Lizzy Creations does some gorgeous tiles, I thought I'd do a moziac themed card for you. I've colored Wonder Regan with copic markers and used Stickles all over her! 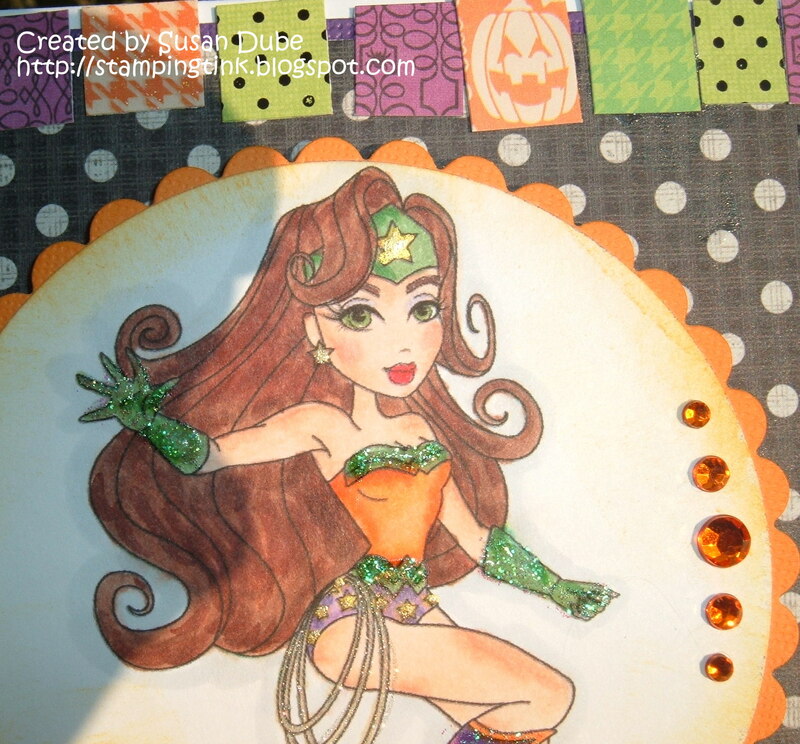 I added some gold Smooch to the stars and my Clear Star Jelly Roll pen on her magic rope. 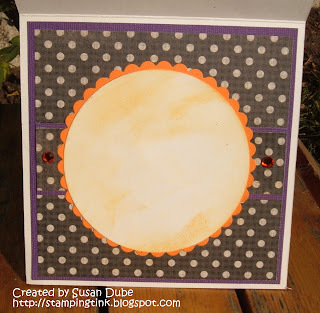 She's cut out using my nestabilities and I used distressed ink in Wild Honey. 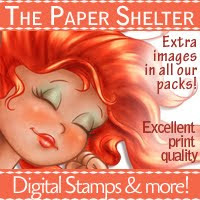 The papers are from Bewitched by DCWV and Paper Pizzaz. The gems are from my stash. Doesn't she have the most gorgeous and determined look on her face? I think she could do some serious crime fighting! My good friend, Judy, is on vacation, but I'm showing my insides for her to see when she gets back. Thanks so much for stopping by! 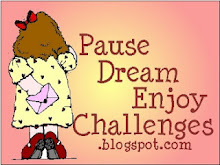 Make sure to stop by our Pause Dream Enjoy Challenge Blog and see what my designing buddies have in store for you. I know you won't be dissappointed! And while you're there, join our challenge and show us your purple and orange! Susan, this is awesome! I love Wonder Regan in orange, green and purple...what a fabulous idea to change up the colors. 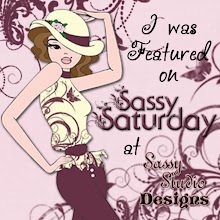 Great background papers and love all that added sparkle. Wow She looks Amazing. Love the way you colored her up. 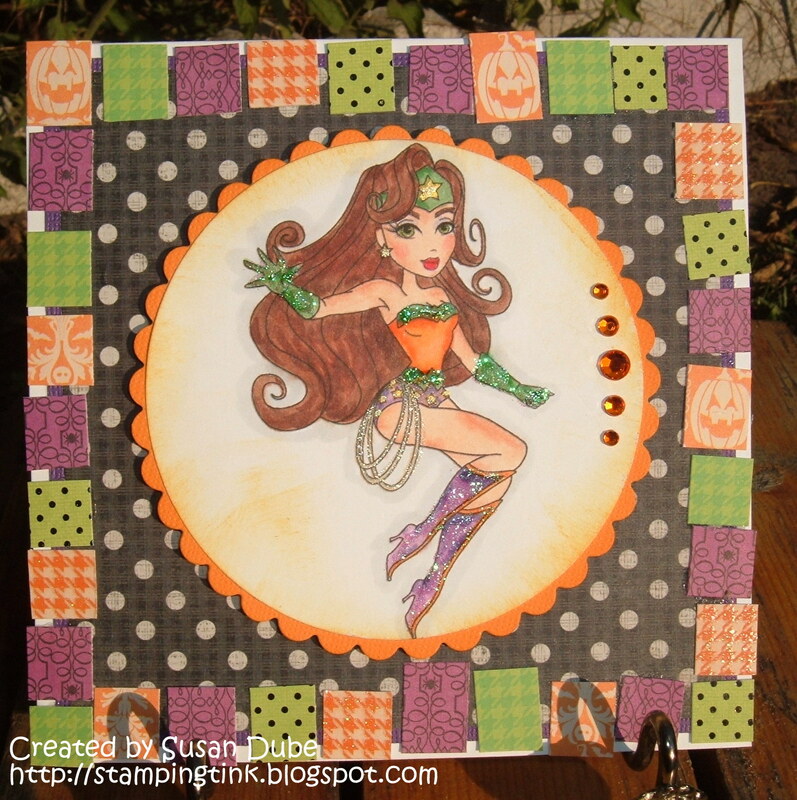 You have wonderfully colored & embellished the Wonder Reagan card. Happy to be a member of PDE Group B.
I do love her expression! You can tell this girl is a fighter!! Beautiful layers and coloring darlin! !